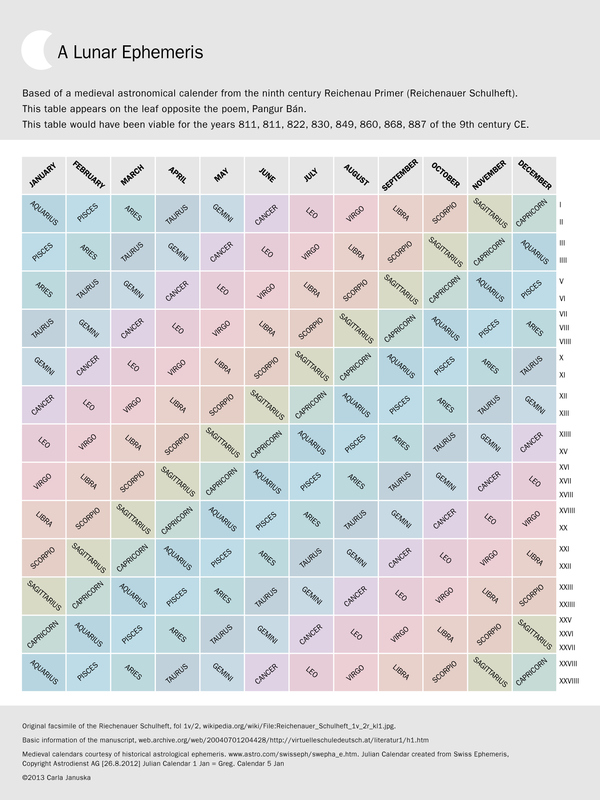 http://smarthive.com/item/a-medieval-lunar-ephemeris-redesigned/ I wanted to recreate an astronomical table I found in the Reichenau Primer, (Reichenauer Schulheft) an early 9th-century manuscript from the St. Paul abbey library in Lavanttal, Carinthia (Stift St. Paul Cod. 86a/1). The Reichenau Primer is best known for the early medieval Irish poem, Pangur Bán about a monk and his cat. On the leaf opposite the cat is an astronomical table that caught my eye. Working through the insular script, I could understand enough medieval Latin to understand the chart. I think it is a table of phases of the moon according to astrological signs.